There are quite a number of portable ice makers that been introduced into the market and you can make ice in less than 6 minutes. The portable ice makers were introduced in the market so as to solve the problem of having to rush to the stores to buy ice or wait for the ice cubes to form in your freezer. The main advantage with the portable ice makers is the fact that they are very light and this makes it easy to move them from one place to another. The design and dimensions makes the ice makers to fit on any countertop without any struggle. How Does the Portable Ice Maker Work? There are light indicators or an alarm system, which will mainly notify you when you need to add water to the tank or when the ice bin is full. You can make ice in a matter of minutes with most cycles lasting between 6 and 15 minutes. Most ice makers will produce 9 to 12 ice cubes in a single cycle. There is a removable ice tray and an ice scoop, which are specifically meant to empty the ice when it is ready. The automatic overflow protection safeguards the machine from any potential damage that may be cause by ice over flowing and as such it stops the machine when the ice bin is full. In recent technologies, most portable ice makers have a self-cleaning function, which is very useful in keeping the machine clean. Water Reservoir: This is simply the water tank, where the water will be poured into for purposes of making ice. Ice Bucket: This is referred to as the ice tray or ice bin in some models. This is where all the produced ice will collect. You should empty the ice as soon as the bucket is full. Drain: The purpose of the drain is to carry away any water that may spill from the machine. Lid: This is the cover of the ice maker, which will protect any pieces from being thrown out of the machine during the process. Control Panel: This has all the buttons to operate the machine as well as the display system, which indicates the progress of the ice maker. It can be really annoying having to rush back to the store every time you need ice. This has been solved by the introduction of the Magic Chef MCIM22TS 27lb ice maker. This is an innovative ice making machine which is portable and can fit on top of any countertop. You can make 9 ice cubes in a span of 7 minutes, which is quite a short time. You will just need water, select the ice sizes that you require and you will have your ice in no time. There is an ice scooper which is essential in scooping the ice from the ice tray to your lemonade, juice, cocktails, iced tea and so many other beverages. With the Magic Chef MCIM22TS 27lb ice maker, you will be able to make about 27 pounds of ice in a day. There are three different ice sizes, which you can choose from, with the ice storage being able to handle a couple of pounds of ice. There is a light which will indicate when the storage is full and requires to be emptied and when to fill up the water reservoir. This appliance is light and you can easily carry around. For most ice lovers, the Magic Chef MCIM22TS 27lb ice maker is among the top-rates ice makers and there is so much value placed on it. This is a necessary accessory in any kitchen, at home or even in the office setting. The Magic Chef MCIM22TS 27lb ice maker has a stainless steel finish, which makes it fit uniquely in any kitchen space. The ice maker has the ability to make up to 27 pounds of ice in a given day, with a single cycle taking about 7 minutes. It comes with an exterior drain and a see-through window. This will drain out any excessive water to prevent any mess. There are 9 ice cubes made in a single cycle. The Magic Chef MCIM22TS 27lb ice maker has light indicators, which are part of the alert system. These lights will indicate when the ice storage has maximum capacity and also when you need to refill the water in the reservoir. The control panel is simple, but effective. This is what makes it easy to operate this machine. There are 3 ice sizes to choose from, which is a great advantage. You can make about 27 pounds of ice in a span of 24 hours, with each cycle running for about 7 minutes and there will be 9 ice cubes produced in every batch. 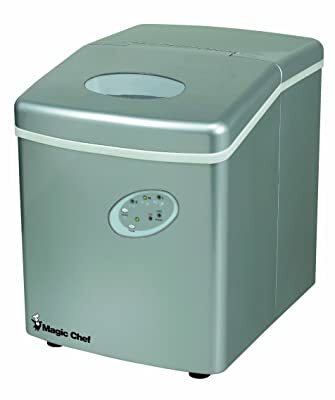 The Magic Chef MCIM22TS 27lb ice maker has an easy-to-use touchpad, with relevant light indicators for selection of ice size, power, add water and so on. The ice maker has an in-built water drain, which will replenish the water and make fresh ice. It has a compact size, which makes it portable and can be setup on any countertop. The machine is ETL-approved, which is a great advantage. There are several consumers who have consistently complained that the machine is quite noisy when it is running. There are instances where the machine has stopped working after a few cycles. There is no constant supply of water since the machine does not have a direct water line connection. In some cases, the Magic Chef MCIM22TS 27lb ice maker takes longer to make a single cycle of ice cubes. The Magic Chef MCIM22TS 27lb ice maker has a wide array of features which has made it to be ranked as a superior ice maker in the market. You will enjoy making tons of ice in a given day since the machine has the capacity of making 27 pounds of ice in a day. A single batch of ice is produced in about 7 minutes and the ice bin has the capacity to hold 4 pounds of ice at a go. Be keen on the various disadvantages that have been mentioned by some consumers. This will help you in making an informed decision about your purchase. 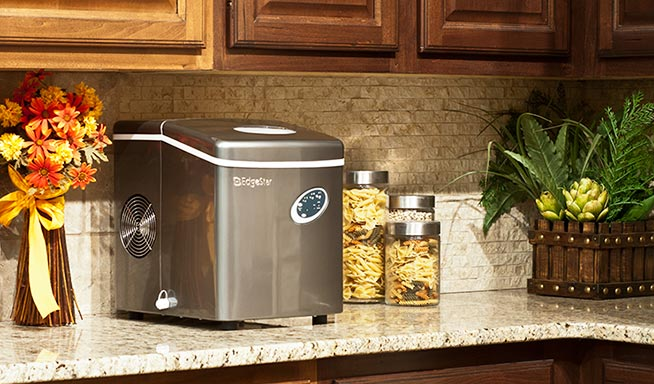 The EdgeStar ice maker has the ability to make 28 pounds of ice in 24 hours. A single cycle takes about 10 minutes to complete and in this time you will have 9 ice cubes. The ice maker has a 1 gallon water reservoir, with an ice bucket that can hold 2 pounds of ice at a go. This means that you will always have fresh ice on your machine. The machine comes with a setting to select three different sizes and this means you will have 3 ice cubes that you can choose from. The control panel is electronic and has controls that are easy to use. This simplifies the operation of this machine. Make 28 pounds of ice in a span of 24 hours, meaning you will have fresh ice anytime that you need it. The water tank in the ice maker is so large that it can take in one gallon of water at a go. You can select from the three sizes of ice that the machine provides. All you need to do is adjust the settings to get your preferred size. 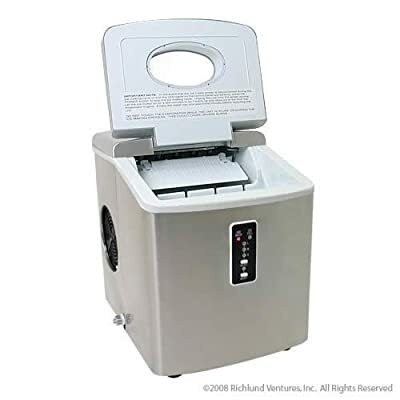 The stainless steel wrapping makes this ice maker more durable that the other similar machine. There are three different ice cube sizes to choose from. The EdgeStar IP210SS has electronic controls with an LED display, which allows you to clearly see what option to select. The water drained is taken back to the water tank to be recycled and produce fresh ice. It does not use too much power and this makes it efficient in as far as power consumption is concerned. Since it has the stainless steel color, it can blend in easily with anything and will not appear to be out of place. You will produce ice in a very short period since it only takes about 10 minutes to complete a single batch of ice. There have been several users who complain of a foul smell when they start using this machine during its first days. The ice also tastes rather bad in those first days due to the stench that it has. However, this does not happen in all machines. The ice usually melts away pretty fast and this forces you to keep producing the ice. In some instances, it seems not to work to full potential and may produce watery ice. There are so many good things that can be associated with this machine. The EdgeStar IP210SS is durable, inexpensive and quite reliable. If you genuinely love ice, then this will be the best machine for you as it has a wide range of functions, which make it possible to make ice without too much complication. There are some minimal flaws that have been pointed out by some of the consumers, which you should also take into account. This will help you make an informed decision by weighing all the relevant factors. 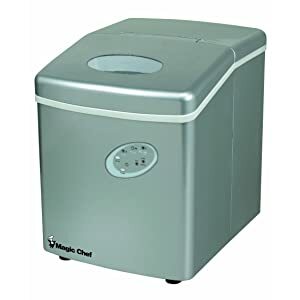 You can go for camping or picnics with this ice maker since it is not too heavy. However, you should note that it does not have an internal battery so every time you are taking it with you; you should ensure that there is a power source. Buying the EdgeStar IP210SS portable ice maker is certainly a worthwhile investment. Avalon Bay AB-ICE26S can generate 9 ice cubes in a single cycle and this takes about 6 minutes. You will be able to produce 26 pounds of ice in a span of 24 hours. This machine has an automatic overflow protection, which will safeguard your computer from any spills of ice that melts away. There are two ice sizes to choose from and you can make ice in large volumes in just a matter of minutes. This ice maker has the capacity to produce 26 pounds of ice in a day. A single cycle takes between 6 to 13 minutes, with 9 cubes of ice being produced within this time. The control panel has LED indicators and easy-touch buttons, which makes it easy to operate the machine. The light indicators are part of the alarm system and will notify you on when to empty the ice bin and when the water tank needs more water. The Avalon Bay AB-ICE26B Portable ice maker has a drain attached at the bottom and makes cleaning easy. The machine has 2-ice settings, giving you the option between small and large ice cubes, which are in the form of a bullet shape. The overflow flow protection system works automatically and this prevents spills from the machine, which may cause it to malfunction. The finish on the machine seems to match any type of home décor and blends in with most color schemes. In the event that the ice is not used and is left in the tray, it melts down and is taken back to the water tank to make fresh ice. Make ice in just a matter of minutes since a single cycle takes only 6 minutes. A single cycle will produce 9 ice cubes. The ice is quite tasty and has a crunchy feel in the mouth due to its texture. The compact size of the Avalon Bay AB-ICE26B makes it possible to place it on any countertop, without worrying so much about the space issue. It only weighs 21.4 pounds, and as such you can easily carry around and use it, as long as there is a power source. Most consumers say that the ice cubes are rather watery and not as cold as they would prefer. There have been a number of complaints in regards to the machine breaking down just after a couple of months. Lack of self-cleaning system is a huge limitation for most consumers as they have to keep cleaning the machine manually. Gone are the days when you would have to wait for the ice cubes to form in your freezer. You can use the Avalon Bay AB-ICE26B to make ice from the comfort of your home. This machine is also very light and this means you can carry around when going for camping and other outdoor activities. You will make ice in less than 13 minutes, and ideally 6 minutes to complete your first batch. There limitations mainly focus on the lifespan of the machine and this is a great factor to consider before making your purchase. 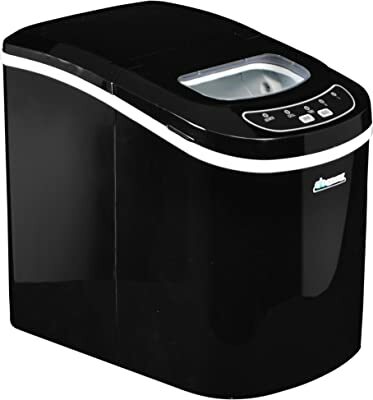 Over and above, the Avalon Bay AB-ICE26B portable ice maker has a whole bunch of benefits, which you can enjoy and thus making it a worthwhile investment for any home or office. The NewAir AI-100R 28-pound ice maker is a compact ice maker that weighs 24.3 pounds and has the ability to produce 28 pounds of ice in a day. It has a freestanding design which will make it easy to set it up. There are electronic controls, which have easy-touch buttons and an LED display. You can make 9 ice cubes in a span of 15 minutes and the ice tray is removable, which makes it easy to empty the ice. The NewAir AI-100R 28-pound portable ice maker has a freestanding and compact design, which makes it easy to set it up. It comes with electronic controls, with easy-touch buttons for purposes of operation. You will enjoy making lots of ice as the machine has the capacity to produce about 28 pounds of ice in a day. A single batch is produced within 15 minutes. In a single cycle, there will be 9 ice cubes that are bullet-shaped. The automatic overflow protection prevents overfilling and blockage of the system. It will automatically shut off when it is full to capacity. The ice bin is removable and this makes it easy to empty the ice cubes that have been made. There is a drain that is mounted on the side, which makes it easy to clean the system. There is an LED display on the ice maker, which is backlit. There is a self-cleaning system that will maintain the ice maker and prevent any damages that may be caused by accumulation of dirt. The blue LCD display is easy to read and as such you are able to get alerts easily. Make ice cubes that are in different sizes from small to the large ones. 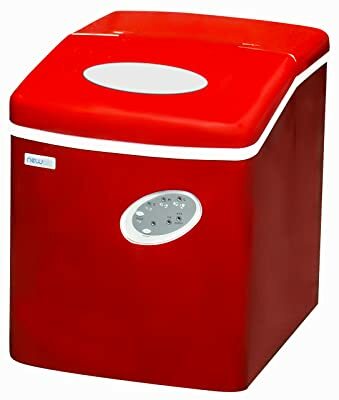 The NewAir AI-215R red portable ice maker has a removable bin, which makes it easy to dispense the ice from the machine. The see through window allows the user to enjoy optimal viewing. You will be able to make 50 pounds of ice using this machine in just 24 hours. The manufacturer provides and one year warranty on this ice maker. Imagine having the capacity to produce 50 pounds of ice in a day? This is the reality with the NewAir AI-215R red portable ice maker and this is one of the main reasons why most people consider it to be a worthwhile investment. You can use this machine in your home or for a party. This ice maker is portable and this means that you can move from one point to another easily. You should consider all the pros and cons before you can purchase this machine. 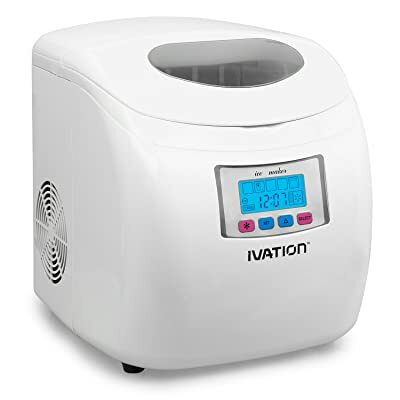 With the Ivation portable, you will have 3 different ice cube sizes to choose from and it will only take about 6 minutes to complete a single cycle. The removable ice tray will allow you to remove the ice from the ice bin easily. This is one of the top rated machines due to the innovative high efficiency compressor refrigerator. The Ivation portable ice maker has an oriented design, which is sleek and integrates amazing features. It comes with a removable ice tray, which allows you to transfer the ice easily from the ice maker. The Ivation portable ice maker has an innovative technology for compressor refrigeration. This will facilitate the process of making ice cubes. There is a clear LCD display, with easy to push buttons for purposes of operating the machine. The machine has an automatic timer, which is programmable and also comprises of essential alerts. The ice storage capacity is 2.2 pounds and has a water reservoir that holds 2.8 liters of water. The backlit LCD display clear and easy to read. This makes it possible to operate the machine without much difficulty. There is a modern compressor, refrigeration technology, which facilitates efficient ice making. The smart alerts will notify the user on when to empty the ice tray and refill the water tank using a beeping alarm. There are three different sizes of ice settings, which give this machine an edge over most of the other ice makers, which provide only two options to choose from. There is an easy-to-use programmable timer, which allows you to set when the machine starts and stops, based on your needs. For some of the users, the alarm system on this machine can be annoying, with the continuous beeps. There are instances, where the ice maker has been reported to be unresponsive when one wants to turn it on or off. The pump is easy to break, with most of users complaining about its failure in barely four months. The fact that the lid is not insulated causes the ice to melt very fast when the ice maker is off. There are tons of issues to love about the Ivation portable ice maker. This is one of the portable ice makers that have embraced modern technology, which is demonstrated by the unique features that the machine has. The design of the machine is unique and it can easily blend in with any kitchen theme. It weighs 25 pounds, and as such moving around with it will not be a problem. There have been complaints in regards to the failure of the pump after a few months, which may a major setback. You should factor in all these issues, when purchasing the ice maker so as to make it useful to you. Assemble all the relevant parts and set up your ice maker in your preferred location. Fill up the water tank and then connect the machine to the power outlet. Select the preferred ice sizes that you want to make and set the timer, if you have the option. Allow six or so minutes and then empty your ice tray using the scoop provided for most models. Unlike the ordinary ice trays, you will be able to produce ice in a fast manner. You can have your ice ready in about ten minutes and get about 30 pounds of ice. The ice makers come with settings to produce different ice sizes and this will allow you to have customized ice that can suit your occasions in the best ways possible. The compact design of the ice makers makes it possible to store it anywhere on your kitchen countertop or even the living room with the appliances that you have. Most of these portable ice makers are made from stainless steel and this allows it to last for a long period of time. The stainless steel is free from any rust and is long lasting. Make as much as 30 pounds of ice in a single day. You can have a single batch of ice made in less than 10 minutes and, in this time you will have at least 9 pieces of ice. There is an automatic overflow protection on most of these ice makers and this will prevent the melting ice from spilling on the other parts of the machine. The control panel is easy to read and this makes it very simple to operate the machine and produce ice anywhere. There are lighted indicators on most of the ice makers, which serve as the alarm system to inform you when you need to empty the ice or refill water in the water reservoir. The dimensions of the portable ice makers will make it easy to install it anywhere as it fit on any countertop, without much of a problem. Most consumers complain that these portable ice makers breakdown easily, just after a couple of months of use. There have been cases of the ice makes producing a bad stench on the first days of use and this also affects the taste of the ice cubes. Some of the ice makers are hard to clean since they lack a self-cleaning mechanism. There are instances where the ice produce is watery and melts away easily. This is a company that has built its reputation around water and portable appliances and this does not come as a surprise that it has some of the best portable ice makers. The company was started back in 2002 and has achieved tremendous growth over the years. The company has been in the business of producing different models of portable ice makers. The Avalon ice makers are known to be durable and have a stylish finish, which can match any kitchen theme that may interest you. The portable ice makers made by Avalon Bay usually produce 9 ice cubes in a single batch. EdgeStar is part of Living Direct and mainly focuses on making portable and innovative products. In most cases, these would be products that occupy minimal space, but are quite efficient. The company has been rated as a market leader in producing portable appliances like the ice makers so as to accommodate the busy lifestyles that we have. The customer support is exceptional and you will get all the support that you will need from the manufacturer. This is truly a green company as it embraces energy conservation in a great way. This is a unique company that makes premier home appliances, which are idea for your kitchen. This is why it is ranked among the top companies with the best portable ice makers. All the products made by the company are styling since the main objective is to accentuate your home. The appliances are also made to efficient in that you will not be disappointed. In fact, in most cases, these appliances surpass the expectations of the consumers. Magic Chef is a brand name that as formerly known as American Stove Company. This is one of the brands owned by MCA Corporation and it specializes in portable appliances and house wares. There are a number of appliances owned by this brand, but the portable ice makers have become an all-time favorite for most consumers. The machine allows users to make ice in barely 6 minutes, without a sweat. This brand has a number of portable ice makers in the market. The company enjoys the reputation of being one that produces eco-friendly products. The portable ice makers are a great innovation, which is aimed at helping the busy consumers get ice in just a couple of minutes. All the appliances are made so as to ensure that you conserve energy when using them. The quality of the items that the company produced is unquestionable and seems to last for a very long period of time. Start by analyzing your needs as far as the ice is concerned in terms of amount required, ice sizes and so on. The second step is to find the various models and compare the features and functions of each. You should focus on the dimensions and weight of the ice maker, depending on where you want to set it up. The size of the water tank, capacity of the ice bin is also a significant consideration. You should also look into the details of the control panel; the buttons and the display. Look at the warranty details of the ice maker. One of the main advantages of having a portable ice maker in your home is the fact that you make ice at any time that you choose. If you have frequent parties, then you may need to consider having a portable ice maker in your house. The beauty of this machine is the fact that it is fully portable and this means that you can easily carry it around in your boat, RV, to your camping trip and so much more. There are countless benefits that are associated with the portable ice makers and everyone is rushing to buy one. However, before buying an ice maker, there are a number of tips that we would love to share with you so as to help you in making an informed decision on your purchase. It is imperative to consider the storage capacity of the ice maker that you are buying. This will determine the amount of ice that the machine can hold at a given time. If you have a high demand of ice, you should try to source for an ice maker that will hold a whole lot of ice. In most cases, most of the portable ice makers will hold2 to 3 pounds of ice in a given time. This is another essential factor to consider as it will determine the lifespan of your ice maker. There are some complex models that will require serious maintenance procedures like draining water, replacing filters and so on. There are others that will only require simple cleaning as the maintenance process. If you are not sure of this fact, you should not buy that particular model. Just like any other machine or appliance, the maintenance is what will extend the lifespan of the machine. While this may appear to be an insignificant consideration, it is important to establish the type of ice cubes that the machine is able to make. This may be in terms of the size as well as the shape. Most modern ice makers have the settings, which allow you to choose from three different sizes of ice cubes. Getting an ice make that has versatility in terms of the ice cubes it produces is an added advantage. The other important factor to consider when you are buying your ice maker is the speed through which it produces the ice. Most machines will produce a single cycle in about 10 minutes, with a capacity to produce about 30 pounds of ice in 24 hours. This will mainly be advised by your need for ice so that you can judge if the machine will be able to fulfil your demand for ice. There are some models that will take some time, after starting, before producing ice. Most of them, usually take 8 to 12 minutes to commence ice production. A machine that has an LCD display seems to be unique and easy to read. When you are shopping for a portable ice maker, you may also want to consider one that has a back light. This will make it easy to operate the machine even at night without any problems. The display will also make it easier to read various indicators. With these basic tips, the process of buying a portable ice maker should not be too much of a problem. These are some of the guidelines that you may use so as to ensure that you will get optimal benefits from the ice maker that you purchase to make ice from the comfort of your home. What else do I need to know after purchasing my ice maker? You should bear in mind that the ice maker is not a freezer and as such ice will tend to melt away very fast. You should use your ice right away or transfer it to a freezer so as to prevent it from melting. Should have a water line for my ice maker? You do not need a water line so as to use your portable ice maker. You will fill up the water tank manually and start the process of making ice. How fast are the portable ice makers in ice production? The speed of ice makers may vary in different models. However, it takes less than 10 minutes to complete the first cycle of ice production. The size of the ice being produced also affects the amount of time production takes. What is the size of portable ice makers? For most models, the height is about 15 inches and a width of about 12 inches. This is what makes them compact in size and allows them to fit in any space easily. Can I carry my ice maker to any place? Most models of the portable ice makers weigh less than 30 pounds. This means that you can easily carry them around and make ice from any location as long as there is a standard power outlet available. How do I maintain and clean my ice maker? One of the most essential aspects of maintaining your portable ice maker is ensuring that it is clean. You should periodically clean the ice maker so as to ensure that it works properly. In order to clean the ice maker, use an ice machine cleaner, which is added to water and poured into the water tank. Run the ice maker and allow all the water to be made into ice cubes and this solves the cleaning issue. The production capacity refers to the amount of ice that the ice maker can produce in a given period. Most ice makers will produce between 25 and 35 pounds of ice in a period of 24 hours. This will vary, depending on the model of your ice maker and the environment, you are in. What is the ice storage capacity? The ice storage capacity is the amount of ice that the ice bin can hold at a given time. This will also vary depending on the particular model that you have, with most of them holding about 2 pounds of ice at ago. The automatic overflow protection will shut off the machine when the ice bin is full to capacity so as to prevent spillage. Will I require a drain line for my ice maker? Portable ice makers will not require a dedicated drain line since the water is redirected to the water tank for reuse. When the ice melts, the water flows back to the reservoir and fresh ice is produced, thus eliminating the need for a drain line. Ideally, any water can be used to make the ice cubes, using the portable ice makers. However, using bottled or filtered water will enhance the quality of ice produced. When you buy your portable ice maker, it has a user manual, which will provide details on how to use it. Ideally, all you need is to set it up, with most of them not requiring permanent installation. In most cases, these ice makers use standard power outlet, so you do not have to worry about that. Once you set it up, add water to the reservoir, select the ice size sizes and start your machine. Within a couple of minutes, you will have your ice in the ice tray ready for use. Generally speaking, the portable ice makers are a great revolution that has joined the appliances market. This will save you the numerous trips that have to make to the grocery store to buy ice. There are so many brands that have come into the market and this might confuse many consumers. The pointers mentioned above are aimed at making this process easier for the ordinary consumer.